Exceptional sea views from this delightful villa nestled into the hillside. toilet, Additional cloakroom with WC and hand basin. Both bedrooms have their own en suite bathroom. The kitchen is very well eqipped with stainless steel saucepans, full crockery set, cutlery set, kitchen knives,mixing bowls, salad bowls, wine glasses, champagne flutes, tumblers. The kitchen is well equipped with a cooker, fridge freezer, micro wave, dishwasher, toaster and kettle. The dining area is adjacent to the kitchen. However, most guests prefer al fresco dining on the large terrace. The pool is kidney shaped and is 8.5 m x 4.0 m.
The villa is cleaned weekly with a full linen and towel change. We ask that guests please bring their own pool towels. We had a car so were able to go to all local beaches. Our favourite were Dafnoudi and Kamilia. Nice meal at Ellie's in Fiscardo. Used a local taxi which was only 10€. P.s I don't often fill these in! Perfect peace in every way. Just the most wonderful villa. The views, the peace and quiet, the beautiful island. What more can you ask. We would really love to return in the future. Nick was so helpful and pleasant. Thank you. Fantastic location, beautiful house, garden and pool. The best holiday house we have ever been to - and we will definitely be back. The villa was perfect. We had a wonderful two weeks in this beautiful part of the island. Very quiet and relaxing. The views from the terrace are out of this world. We couldn't fault it. There are some lovely restaurants around but our favourite was Odysseas at Agia Jerusalem. We had never been to Kefalonia before and we were so pleased we chose this location and the villa at Katsarata. The villa itself is spacious, spotlessly clean and has modern amenities. We had breakfast every day on the sunny patio with spectacular views of the sea, mountains and forests. The nearby harbour of Fiskardo is a great place to eat in the evening. We drove there most times (it takes about 10 minutes) but you can also walk on well-signposted tracks direct from the villa which took us 45 minutes each way. There are lovely beaches and other places to visit - like the castle at Assos and the nearby beach at Myrtos. Also, if you are walkers like us, there are a lot of walks to various villages and places of interest - all are very clearly marked so you can't get lost. We will certainly be booking again for next year! This is a super house in a fantastic position. The helpful notes that were left by the owner really made the visit stress free. This is a wonderful part of the island! 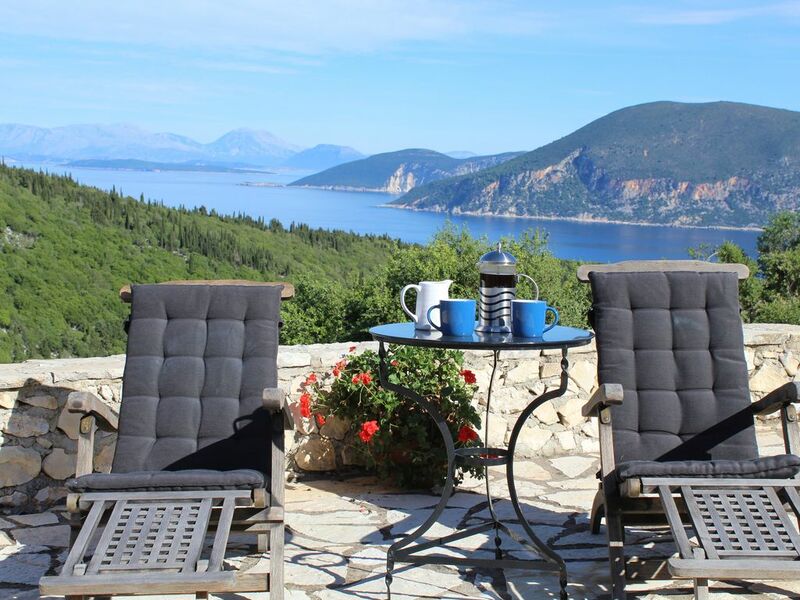 The villa has superb views over neighbouring islands of Ithaka, Lefkada and mainland Greece. Fiscardo is the centre of the area and is well known for its beautiful harbour, picturesque Venetian buildings and selection of tavernas and cafes. The area has beautiful small bays and coves for swimming and snorkelling, pathways through wooded areas and traditional villages with tavernas and shops.